An early-morning drive to work, low sun gleaming through the remnants of fog, Vivaldi on the radio: Concerto for Two Cellos, a deeply mellow, haunting work of music…and I tried to recall my first encounter with Vivaldi’s music. I am quite sure it was an old Angel Records LP of The Four Seasons in my parents’ modest record collection. When I was old enough to read, I was curious enough about the music to study the record cover, where I learned that Vivaldi was born in 1678 in Italy and had red hair. Our ancient set of encyclopedias (The Book of Knowledge) said he taught music to little girls in convent school. These details, which taught me little about baroque music itself, nonetheless appealed to me as a child who wanted stories. The music seemed to tell me stories, as well–thunderstorms, blizzards, birds at daybreak, mountain streams, slow rivers in the summer sun. Because I wanted stories, because I sought information and details, I turned to what seemed to me the most obvious place: the library. For three years of my early reading life, that was the Yonkers Public Library’s “new” branch, which seemed impressively modern at the time and which had a fabulous children’s area. Why I associate Vivaldi with colored light filtering through the clerestories of the library, I don’t know. That’s just how memory works. I also associate my visits to the children’s room at the library with the beginnings of a lifetime of self-teaching through books, music, museum-going, travel, art, conversation, observation, research, and writing. That connection is a little easier to make. Because I was an introverted child, I watched more than participated in the events going on around me. When I wanted to know more, I was often too shy to ask–so I tried to find the answers myself in the place I imagined to be the best repository of stories and information. It was also the only place I knew that could offer such knowledge. This brief explanation suggests that I became an autodidact because I was socially maladaptive. Or maybe because I was passionately curious about the world. Or because the library room was so magical. Any of which may be at least partially true. But what I want to say in this post–far too briefly because the idea deserves further reflection–is that while I work in an institution of higher learning and while I believe in the value of higher education, I also believe we can educate ourselves exceedingly well without college degrees. Lack of a degree can limit people in the job market, no doubt; yet some of the most intelligent, interesting, best-educated people I know happen to be largely self-educated. The autodidact has the motivation of personal passion and the ability to be directed by chance and interest, not just to be guided through coursework considered culturally or economically valuable. Most of my older friends have become wise and clever by attending the school of hard knocks and through their personal curiosity and inventiveness; they are true autodidacts, even the ones who actually do have PhDs…but especially the ones who don’t. Can I go so far as to suggest that we need our libraries more than we need our universities? Why not? I think I started my “college education” when I was six or seven years old because I had the desire to know, the curiosity, the interest. My parents encouraged me, which helped. (For one thing, I could not have gotten to the library if my mother hadn’t taken me there!) Some of my school teachers were also encouraging, but their encouragement mattered surprisingly little. What made the difference was the reward of finding something new, learning a new story, adding details to a foundation of things that interested me. One of my tasks as a teacher, a poet, and as a mother is to foster that element of excitement when I sense it in someone and to encourage self-directness in each person’s education. Delight: a crucial ingredient in learning that can take awhile to locate but that will motivate a lifetime of knowledge-gathering. Maybe you can find it at the library, too. This entry was posted in Books, Teaching & Pedagogy and tagged autodidact, education, library, music, stories, Vivaldi, Yonkers Public Library. The Book of Knowledge! My Pop-pop (maternal grandfather) read the entire set when he was a boy. I just ran across it up in the barn. It’s in pretty bad shape, unfortunately. I think I will have a few more posts on the library topic. Kind of jogged a bunch of memories and ideas for me. We had The Book of Knowledge from 1929. Under US Presidents, the most recent listed was Calvin Coolidge! The names of African countries (among others) were woefully outdated, yet at age 9 I knew where “The Rhodesias” were; that sort of obscure information really helped me when I encountered texts from the 1930s and earlier in my lit or history classes. And those volumes were full of literature. The organization of those books was so odd, you kind of had to read the entire set and/or learn how to use an index–which I did (another truly useful skill!). Growing up in a huge library must have been wonderful!! Oh, such interesting & though provoking ideas! Hello Ann! I came here looking for the author of an article – “Mother-Rhythms” which was published in the October 1998 issue of Welcome Home, the monthly journal published by our nonprofit organization Family and Home Network. I am almost positive that I found the right person! Would you give us permission to post “Mother-Rhythms” on our website? I would, of course link to your blog or any other page(s) you’d like. And – I’ve read just this one of your posts here, I love it. I’m continuing to build our website and would love to point to this post on libraries and education… I’d like to talk with you, if you’re willing would you please email to me? Please know this post is in my permanent Ann E. Michael file. What a lovely it is! As a fellow autodidact, your library memories provoked my memories, a return trip trip I have enjoyed thoroughly. Public libraries are such a treasure, and I worry about them. For autodidacts everywhere, I thank you for this post. A library is a collection of one point of view after another of every story that has ever been told or so I like to think. Wonderful post, Ann. Thanks so much! Libraries have often been like second homes for me. I always feel comfortable in them. When my daughter toured Vassar College a few years ago, I walked into the library there and announced my intention to move in permanently. My daughter was only moderately embarrassed (she’s used to me). Hi, your posting on the Grinton Will Branch came to my attention today. I’m the assistant director of the Yonkers Public Library and your story brought a smile to my face. 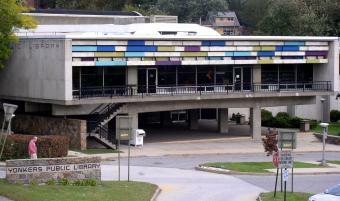 FYI, our ‘new’ library is 50 years old in November and still striving to improve the lives of its patrons. Thank you for your kind words. I’m so thrilled that you found my post! I cannot tell you the extent of my happiness when I learned the Will branch is still extant and operating and as modern-looking as ever (when so many libraries have been closed down or torn down). Though the reminder that the new library is 50 years old is a sobering reminder of my own age, I am happy to report that the library’s purpose of “improving the lives of its patrons” was accomplished in my case. Many thanks, Edward, to you and your predecessors. As with your other commentors, I too appreciate your post and the well-deserved lauding of public libraries all over the world… long may they live and prosper! As to self-education, I daresay it is a true statement that all well-educated people are self-taught… however, regardless of where one finds them in life, there are special teachers who can do a great deal to help one illuminate aspects of life which might otherwise go unnoticed. Like you, I have been having many random memories pop into my head from all eras of my life lately… and certain teachers I had all through my school years come into my mind at odd moments. I am utterly grateful to those who helped point the way along my own life’s education, as well as my three daughters’. And by the way, the Danish library system is truly wonderous…. can’t wait to visit the libraries of England one fine day also!